I greatly enjoy reading the biographies of scientists, and when doing so I always hope to learn the secrets of their success. Alas, those secrets generally remain elusive. Now that I find myself in the surprising situation of having to write my own biography, and thus to reflect on my career, I find the same mystery. I do not know why I have always been fascinated by science, or why I have been driven by the intense desire to make some original contribution. And although I have had some degree of success as a scientist, it is hard to say precisely why. Nevertheless, I have attempted to identify some of the incidents and decisions that helped or hindered me at various times, in the hope that these anecdotes might be helpful to those embarking on a scientific career. I have generally sought to work on questions that I thought were both interesting and approachable, yet not too widely appreciated. To struggle to make discoveries that would be made by others a short time later seems futile to me. This, coupled with a distaste for direct competition, attracts me to areas of science that are less densely populated. On multiple occasions, I have been led into these new areas by talking to people working in fields quite different from mine. The confluence of ideas from distinct fields seems to create a kind of intellectual turbulence that is both exciting and productive. My knowledge of the details of my family history is rather sketchy. My paternal great-grandfather was born near Cracow, and emigrated to New York City in the late 19th century, but ultimately settled in a small farming town in Saskatchewan, Canada where my father was born. Eager to escape the small town isolation, my father left as soon as he could by joining the Royal Canadian Airforce (RCAF) towards the end of World War II. He was trained as a pilot but fortunately the war ended before he could serve in combat, and he was then posted to Ottawa. My mother’s family came from England but settled in Ottawa, where my mother was raised and met my father after the war. Shortly after they married my parents moved to England for my father’s continued training in aeronautical engineering at Imperial College, London. I was born in London, England during the great fog of 1952, but survived the coal-fueled air pollution with no ill effects and after less than a year in England was carried to Canada by my parents. My father continued to work as an aeronautical engineer for the RCAF for the next twenty years, and our house was always decorated with models of the airplanes he worked on. After he retired my father joined the civil service, and for a time studied issues of Arctic transportation; I remember him telling me about the complex properties of Arctic sea ice. Some of my work has an engineering flavor, in that we build structures and test their properties, and it’s possible that it may reflect some influence of my early home life. But a more direct influence stems from the fact that my father was often unhappy with his job, chafing at both his superiors and his subordinates. This I am sure made me seek out the academic life for its more egalitarian aspects. I have never felt like I worked for a boss or had employees who worked for me, just colleagues who like me were interested in learning more about the world around us. Figure 1. Family photos. 1A: Photo taken by my mother (Vi Szostak) on the HMS Homeric, as we returned to Canada in 1960 after three years on the RCAF base in Zweibrücken, Germany. Left to right, me, my mother and sisters Kathy and Carolyn. 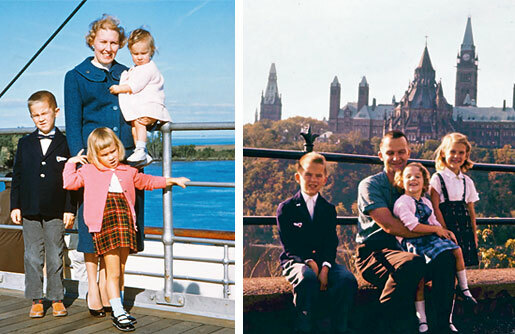 1B: Photo taken by my mother, in Ottawa, 1963, showing me, my father (Bill Szostak), and sisters Carolyn and Kathy, with the Canadian Parliament Buildings in the background. My childhood was punctuated by frequent moves, as my father was transferred to different Air Force postings in Germany, Montreal, and Ottawa (Figure 1). At the time many school systems encouraged students to advance as rapidly as possible; as a consequence I was often the youngest in my class. Although socially difficult, this was more than compensated for by making my classes more interesting than they would otherwise have been. Some of my earliest recollections involve grade school math. Learning about fractions was for some reason surprising enough to have stuck with me for the rest of my life; similarly, my discovery of quadratic equations in grade 5 was a revelation. Later, at Riverdale High School in suburban Montreal I was fortunate to have some exceptional teachers. Don Hall struggled to answer my strange science questions, and Irene Brun (now Winston) inspired a life-long love of biology. At the same time, my interest in science was encouraged at home. My father built a basement chemistry lab for me, and the experiments I conducted there often made use of remarkably dangerous chemicals that my mother was able to bring home from the company where she worked. My mother also helped me to get my first summer job, in a chemical testing laboratory at the same company. This was a good window into the importance of quantitative analysis, but the repetitive nature of the work was not at all interesting. Some of the experiments carried out in my basement lab were much more dramatic. For example, with my father’s assistance, shortly after the tragic Apollo 1 fire, we prepared and collected a jar of pure oxygen. We then carefully lowered a small quantity of methanol into the oxygen reservoir. The transformation of the barely visible pale blue flame in air into an intense jet of fire in oxygen was amazing, but also horrifying in the context of the recent Apollo fire. Less carefully supervised experiments frequently led to explosions, which made chemistry seem much more dramatic than one would guess from the textbooks. My failure to carefully separate the hydrogen evolved during electrolysis from ambient air led to an impressive explosion which resulted in a glass tube being embedded in a wooden ceiling rafter. I also participated in more biologically oriented projects with my high school friend Joachim Sparkuhl. In the basement of his house we constructed a small hydroponics garden, inspired, I believe, by the idea that astronauts living on some future space station would need or want to grow their own fresh food. In 1968 I began my undergraduate studies at McGill, at the age of 15. My first laboratory work at McGill involved helping a chemistry graduate student to purify cholesterol, the starting material for the synthesis of sterols. We started with large sacks of gallstones, which we would dissolve in hot solvent, and then recover the iridescent crystals of pure cholesterol after the solution cooled. While this was a useful experience, it did not inspire me to remain in chemistry, and the pull of biology increased as new opportunities opened up. To my surprise I was accepted into a summer research program for undergraduates at the Jackson Laboratories, a renowned mouse genetics institute on Mt. Desert Island off the coast of Maine. The environment was idyllic, and the program combined intense scientific education and hands-on experimental work with outdoor activities such as hiking up Cadillac Mountain and observing the beautiful organisms that populated the nearby tidal pools. The Jackson labs are a mouse genetics research facility, and this influenced my future scientific career in an unexpected way. My project, carried out under the guidance of Dr. Chen K. Chai, involved the analysis of thyroid hormones in various mutant strains. This required the careful dissection of the thyroid gland from many mice. Although I was, after much practice, able to remove the thyroid without (at least most of the time) severing any of the many nearby major blood vessels, I strongly disliked the process of killing and dissecting the animals, and by the end of the summer had vowed never again to work on animal models. Back at McGill the next fall, this time as a resident student (my parents having moved back to Ottawa), I started spending less time in the lectures and more time in the library, and also searching out new labs in which to gain additional experience. I was always surprised when seemingly intimidating Professors welcomed me into their labs and invited me to join in ongoing research projects. During this year and the next I did work in several labs in the Biology and Biochemistry departments, generally on plant biology systems. Field trips with Kurt Meier, a specialist in bryophyte biology, inculcated an enduring affection for the simple mosses and liverworts. I apparently did well enough in a physiology course run by Ron Poole to land a summer job prototyping and testing new lab experiments for the following year’s lab course. Although most of my lecture courses were uninspiring, John Southin’s course in Molecular Biology was an incredible exception. I’ll never forget entering the first class and being handed a thick book of printouts, which I assumed were a set of papers we were supposed to read. In fact the whole book was simply a list of references, which we were expected to read and absorb in the library. These readings from the frontiers of molecular biology were very impressive. We read and discussed the beautiful Meselson-Stahl experiment, which was just over a decade old at the time, and learned how the genetic code had been unraveled only a few years previously. The fact that one could deduce, from measurements of the radioactivity in fractions from a centrifuge tube, the molecular details of DNA replication, transcription and translation was astonishing to me. One of the intellectual highlights of my time at McGill was the open-book, open-discussion final exam in this class, in which the questions were so challenging that the intense collaboration of groups of students was required to reach the answers. In my senior year, I began a project in Mel Goldstein’s lab, together with my friend Joachim Sparkhul. The subject of our study was the beautiful colonial green flagellate Eudorina elegans, a smaller version of the more common Volvox. Over the school year and the following summer, we obtained evidence that these algae secreted a peptide hormone that induced spermatogenesis under favorable environmental conditions. This work led to our first scientific publication, which appeared the following year (1). In the fall of 1972 I started my graduate studies at Cornell University in Ithaca, New York. I decided to attend Cornell in part because the A.D. White Fellowship would fully support me, but also because I would be able to pursue my work on Eudorina in the Department of Plant Physiology. At the time, I was enamored with a grandiose plan to develop Eudorina as a simple model system for studies in developmental genetics. This plan did not work out, for several reasons, not least the fact that this sort of ambitious program cannot be developed in isolation by an inexperienced student. Lacking the necessary genetic expertise, and because I was either unable or unwilling to seek out the necessary help, my project became mired in frustrating technical difficulties. However, the periods spent waiting for my Eudorina cultures to grow allowed for plenty of time for conversations with my fellow graduate student John Stiles. John was approaching graduation and was thinking about what to do after the completion of his Ph.D., while I was gradually shifting from thinking about Eudorina to dreaming up some more productive project. We talked a lot about the emerging methods in molecular biology, which were clearly heading towards the ability to explore the structure and activity of individual genes at the molecular level; cloning and sequencing technologies were just beginning to emerge. John and I eventually came up with a specific proposal for a collaborative experiment. Our idea was to chemically synthesize a DNA oligonucleotide of sufficient length that it would hybridize to a single sequence within the yeast genome, and then to use it as an mRNA and gene specific probe. While conceptually simple, our idea was technically challenging. At the time, there was only one short segment of the yeast genome for which the DNA sequence was known, the region coding for the N-terminus of the iso-1 cytochrome c protein, which had been intensively studied by Fred Sherman for many years. The Sherman lab, in a tour de force of genetics and protein chemistry, had isolated double-frameshift mutants in which the N-terminal region of the protein was translated from out-of-frame codons. Protein sequencing of the wild type and frameshifted mutants allowed them to deduce 44 nucleotides of DNA sequence. John and I thought that if we could prepare a synthetic oligonucleotide that was complementary to the coding sequence, we could use it to detect the cytochrome-c mRNA and gene. At the time, essentially all experiments on mRNA were done on total cellular mRNA, rendering efforts to monitor the expression of individual genes almost impossible. John and I were sufficiently confident of our ideas to begin contacting labs where we might pursue the work, with me doing the chemistry, and John working on the yeast biology. At Cornell, there was one laboratory that was the obvious place for such an experiment, and that was the lab of Ray Wu in the Department of Biochemistry. Ray was already well known for determining the sequence of the sticky ends of phage lambda, the first ever DNA to be sequenced, and his lab was deeply involved in the study of enzymes that could be used to manipulate and sequence DNA more effectively. John and I approached Professor Wu, who listened to our proposal and allowed that it was an interesting idea worth exploring. However he was reluctant to appear to be ‘poaching’ a graduate student from another lab and department; another complication was that the work would require collaboration with Fred Sherman’s lab. John applied to Fred’s lab in nearby Rochester, New York, for a postdoctoral position, and was accepted. At Cornell, I persisted and eventually Ray allowed me to transfer into his lab and begin the project. The interlude between wrapping up my work in the Department of Plant Physiology and starting as a transfer student in the Department of Biochemistry provided me with the opportunity for an extended vacation and my first trip to Europe on my own. I began with a visit to Cambridge, England where I was very kindly hosted by Professor Poole (for whom I had worked at McGill), who was on sabbatical at the University of Cambridge. I explored the town and was incredibly impressed by the Chapel of King’s College and the ethereal music therein. Even more impressive was the famous Laboratory of Molecular Biology at the MRC, where I talked with one of the iconic figures of molecular biology, Sydney Brenner. I was asked to wait for Sydney in his office, which I was surprised to notice held two large desks, both piled to the ceiling with papers. When Sydney arrived he told me about his remarkable new project involving the use of the nematode Caenorhabditis elegans as a model system for developmental genetics − this was an impressive if somewhat painful lesson on the right way to carry forward such an ambitious project. I also learned why two desks crammed that small office − it turned out that Francis Crick! After a memorable month of art, architecture and music in Paris, I returned to Ithaca to start afresh in a new lab with a new project. My goal was clear − the chemical synthesis of the oligonucleotide needed for our gene detection scheme. At the time, this was still a challenging endeavor for a student such as myself with minimal synthetic skills. Ray had an ongoing collaboration with Saran Narang, who was developing the solution phase phosphotriester approach to oligonucleotide synthesis. Our plan was to use this approach to prepare large quantities of the five trimers needed to make a 15-mer, then link the trimers together to form 6-mers, a 9-mer and finally a 15-mer. I began the work under the tutelage of Chander Bahl, a postdoc who had some experience with this technology. Unfortunately our lab was better equipped for enzymology than synthesis, and we lacked a critical mass of experienced chemists. After a year of work, I was still far from my goal and becoming increasingly frustrated. Fortunately Ray Wu realized that I needed help, and arranged for me to visit Saran Narang’s lab in Ottawa. There I was fortunate to receive training from Keichi Itakura, who later became famous for synthesizing the gene for insulin. After two weeks of intense training, I returned to Ithaca, and attacked my synthesis with fresh energy. A few months later, I was rewarded with several milligrams of our long sought 15-mer. In collaboration with John Stiles and Fred Sherman, who sent us RNA and DNA samples from appropriate yeast strains, we were able to show that we could use the labeled 15-mer as a probe to detect the cyc1 mRNA, and later the gene itself. This was quite exciting, and seeing our work published in Nature (2) was a great boost to my confidence after years of work with little to show. It was also an important lesson in effective research strategy, imprinting on me the value of seeking help from knowledgeable people when faced with difficulties. One of the delights of the world of science is that it is filled with people of good will who are more than happy to assist a student or colleague by teaching a technique or discussing a problem. The completion of my Ph.D. in 1977 marked the beginning of a major scientific transition for me. Against all commonsense advice, I decided to remain in Ray’s lab for postdoctoral work, but in a very different scientific area. The decision was triggered by the arrival in Ray’s lab of a new postdoc, Rodney Rothstein, from Fred Sherman’s lab in Rochester. Rod was already a seasoned yeast geneticist, but had little experience with molecular biology; in contrast my graduate work was in molecular biology but I had no practical experience with genetics. We hit it off and essentially trained each other through our collaborative work on yeast transformation. Our frequent discussions were long and often loud, sometimes triggering mild protests from Ray who would emerge from his office and ask us to turn it down a notch when he needed a quieter atmosphere in which to work. The combination of the molecular biology I learned in Ray’s lab and the genetics I learned there from Rod prepared me well for the next decade of my work on yeast, first in recombination studies, and later in telomere studies and other aspects of yeast biology. Ray was a wonderful advisor (3), and in addition to his scientific advice I absorbed much of his way of running a lab, which in essence was to be there when advice was needed but otherwise to let creative students and postdocs run with their ideas (Figure 2). Figure 2. Ray Wu’s lab, circa 1978. 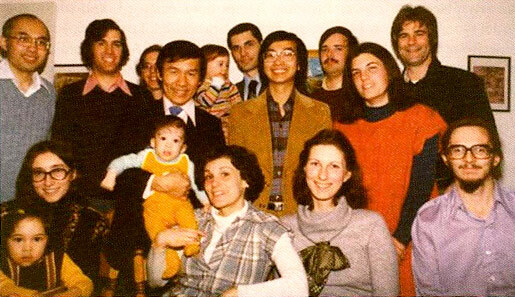 Top left, my graduate and postdoctoral advisor Ray Wu; next to him is Rodney Rothstein, who introduced me to yeast genetics. I am seated at the lower right. My postdoctoral studies of recombination in yeast were enabled by the discovery, in Gerry Fink’s lab at Cornell, of a way to introduce foreign DNA into yeast (4). These pioneering studies of yeast transformation showed that circular plasmid DNA molecules could on occasion become integrated into yeast chromosomal DNA by homologous recombination. Rod and I began to search for ways of increasing the frequency with which transformants were recovered. Increasing the target size for recombination seemed like a good possibility, and indeed when I transformed yeast with plasmids containing fragments of rDNA, I did recover more transformants, and these contained plasmid DNA integrated at the rDNA locus. These strains allowed me to initiate studies of unequal sister chromatid exchange in rDNA locus, resulting in my first publication in the field of recombination (5). Towards the end of my stay in Ray Wu’s lab, Rod and I came upon the first hints of double-strand break stimulated recombination in yeast. Our preliminary experiments suggested that cutting plasmid DNA within a region of homology to yeast chromosomal DNA led to an increase in the recovery of transformants, presumably reflecting increased recombination of the input DNA with the homologous chromosomal locus. The idea that you could increase transformation frequency by cutting the input DNA was pleasingly counterintuitive and led us to continue our exploration of this phenomenon. My first independent position was at the Sidney Farber Cancer Institute (now the Dana-Farber Cancer Institute). I owe a great debt to Professor Ruth Sager, who was the main force behind hiring me. She established a terrific group of young investigators in her division, including Richard Kolodner and Gerry Rubin, creating a superb intellectual atmosphere. Ironically, I heard many years later that Ruth was only able to hire me over the objections of some of the senior clinical faculty, who did not believe that studies of yeast had any place in a cancer institute. Times have changed, and fortunately model systems are now much more widely appreciated. My graduate students came from the graduate program at Harvard Medical School, where I had an academic appointment in the Department of Biological Chemistry. These students were wonderful, and together we made rapid progress in setting up a productive yeast genetics lab. Our initial focus was the study of double-strand breaks in DNA and their repair by recombination. This work was spearheaded by my first graduate student, Terry Orr-Weaver, who is now a Professor at the Whitehead Institute and MIT. Terry’s work, and our continuing interactions with Rod Rothstein, led us to think intensively about the kinds of reactions engaged in by DNA ends (6). There was considerable debate about different models for recombination within the wider DNA repair and recombination community, and seminars and conferences were important means for the exchange of the latest information. For many years, the major international recombination meeting was held in Aviemore, Scotland, which afforded the opportunity to sample diverse single-malts while discussing the intricacies of genetic exchange. I do recall that excessive sampling at one Aviemore meeting did make it difficult for me to present my work the next morning. I also enjoyed attending Gordon Conferences and Cold Spring Harbor meetings, which were small and highly interactive meetings that provided wonderful opportunities for young scientists to present their work and meet and talk to people doing the best and most important current work. In the summer of 1980, I attended the Nucleic Acids Gordon Conference, expecting to hear the latest advances in DNA synthesis, sequencing and repair. However, for me the high point of the meeting was hearing Liz Blackburn talk about her work on telomeres in Tetrahymena. Our subsequent discussion led to the initiation of a collaboration in which we decided to test the ability of Tetrahymena telomeres to function in yeast. Those experiments are described in my Nobel Lecture; here I will just say that it was an incredibly exciting time for me. I performed the experiments myself, and experienced the thrill of being the first to know that our wild idea had worked. It was clear from that point on that a door had been opened and that we were going to be able to learn a lot about telomere function from studies in yeast. Within a short time I was able to clone bona fide yeast telomeres, and in a continuation of the collaboration with Liz Blackburn’s lab we soon obtained the critical sequence information that led us to propose the existence of the key enzyme, telomerase. With the success of the recombination and telomere projects, my lab began to grow. My second graduate student, Andrew Murray, now a Professor at Harvard, began to work on building artificial chromosomes. Andrew was a brilliant and energetic student who was fun to talk with about any conceivable experiment; his colorful personality (and dress) enlivened the lab. 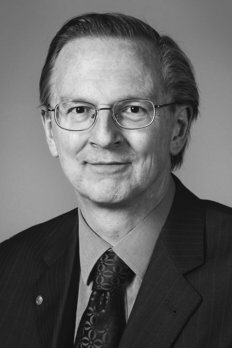 My collaboration with Rod and Terry grew to include Frank Stahl, the world’s leading expert on the genetics of meiotic recombination, with whom we had many detailed discussions of the genetic implications of specific physical models. I particularly remember an afternoon I spent at Frank and Mary Stahl’s house in Eugene, Oregon, going back and forth with Frank about different versions of the double-strand break repair model as we worked on our manuscript (7). It was an intense and stimulating experience that I still treasure. After five very productive years at the Farber, a remarkable opportunity induced me to move to the fledgling Department of Molecular Biology at the Massachusetts General Hospital (MGH). Howard Goodman, the founder of the Department and a major figure in the emerging field of biotechnology, had arranged an extremely interesting and innovative academia/industry collaborative venture. In this deal, the pharmaceutical giant Hoechst AG agreed to fully support all research in the MGH Department of Molecular Biology for a period of about ten years, in return for limited intellectual property rights. This was extremely attractive to me, as it promised to allow me to pursue research in any direction that I found to be of interest, without having to worry about obtaining traditional grant support for novel and hence untried ideas. Thus, in the summer of 1984 I moved my lab from the Farber to our new home in the downtown Boston campus of MGH (humorously referred to by colleagues at MIT’s Whitehead Institute as “one of the finest research institutes in downtown Boston”). At that time, I was actively exploring the possibility of moving into other fields. By 1984, I had a growing feeling that my work in yeast was becoming less significant, in the sense that other people would inevitably end up doing the same experiments we were doing in a few months or years at the most. To learn more about other fields and to prepare myself to work in a new area I audited several courses at Harvard. A delightful course by Steve Kosslyn on cognitive psychology explored the fascinating correlations between localized brain lesions and cognitive deficits, and highlighted the emerging neuroimaging technologies that were promising to revolutionize studies of brain function. I also audited an applied math course to brush up on the skills I would need should I decide to seriously enter into structural biology. Finally an outstanding course on enzymology and catalytic mechanisms by the late Jeremy Knowles stimulated my interest in catalysis. Later, when Jeremy left science to become Dean of the Faculty of Arts and Sciences at Harvard, I had the good fortune to “inherit” one of his graduate students, Jon Lorsch, who migrated to my lab and did outstanding work on ribozyme selections and mechanistic enzymology. The combination of Jeremy’s enzymology course and the recent discovery of ribozymes by Tom Cech and Sid Altman (who shared the 1989 Nobel Prize in Chemistry for their work), ultimately led me to begin a transition to work on ribozymes. This seemed like a reasonably conservative way to switch fields, since the methods used to study ribozymes were largely a combination of molecular biology and chemistry. I was surprised that so few people were entering the field, since I thought that there were major questions to be addressed in terms of understanding the origins of biological catalysis in the hypothetical RNA world that preceded the evolution of protein synthesis. I began to work with RNA myself, playing around with Cech’s Tetrahymena ribozyme, which I obtained from the same piece of DNA that contained the Tetrahymena telomeres I had worked on just a few years earlier. The first student to join me in this new area was Jennifer Doudna. Jennifer had actually come to my lab to work on yeast genetics, but I was fortunate to persuade her that the future lay in RNA. Jennifer’s energy and determination drove our efforts to convert self-splicing introns into an RNA replicase. We were soon joined by Rachel Green and several other dedicated students, techs, postdocs, and a memorable sabbatical visitor, François Michel, who impressed everyone with his work ethic, his uncanny ability to intuit structure from phylogeny, and his parallel career in butterfly evolution. Even as I pushed our gradual transition to a focus on RNA, I maintained a substantial effort in yeast genetics for several years during the mid to late 1980s. My interest in recombination and telomeres had not disappeared, and I wanted to bring our earlier advances to a satisfying conclusion. Recombination remained a large part of the lab, with Doug Treco, Alain Nicolas, Neil Schultes and Hong Sun maintaining a focus on the role of double-strand breaks in meiotic recombination. Most important for the telomere story was Vicki Lundblad’s ground-breaking work on telomere genetics in yeast, which provided a link between telomere maintenance and senescence and aging (8). Barbara Dunn linked the telomere and recombination realms by study the transfer of sub-telomeric repeats between chromosomes by recombination. Figure 3. 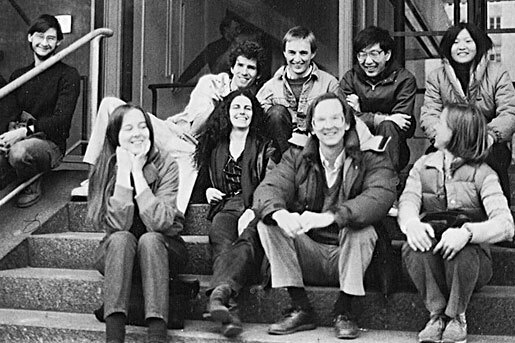 The Szostak lab, circa 1985. Top row, from left: Neil Schultes, Andrew Murray, Dean Dawson, Neil Sugawara, Hong Sun. Bottom row, from left: Vicki Lundblad, Barbara Dunn, Jack Szostak, Stephanie Ruby. By end of the 80s, our yeast work was almost done, and the lab was increasingly focused on RNA. The RNA floodgates really opened with the work of Andy Ellington on in vitro selection (9), which ushered in a new era of work on the in vitro directed evolution of new functional molecules. Over time we came to feel that we could evolve a binding site for virtually any target molecule, using any kind of nucleic acid. This confidence led us to try to evolve new catalysts, and, returning to the RNA world hypothesis for inspiration, we aimed for the chemistry of nucleic acid polymerization (10). This was the basis of Dave Bartel’s ground-breaking work on the selection of ribozyme ligases, which he subsequently (in his own lab at the Whitehead Institute and MIT) evolved into an RNA molecule with bona fide RNA polymerase activity. Our advances fueled my interest in the role of RNA in early evolution and seemed to bring the resurrection of the RNA world almost within reach. Our ability to evolve new aptamers and ribozymes was so intoxicating that my lab spent most of the 90s exploring the range of possibilities and the limitations of what RNA could do. Our advances began to attract attention, leading to my election to the National Academy of Sciences and appointment as a Howard Hughes Investigator in 1998. At the same time, the Hoechst funding of my department was winding down, making my HHMI appointment particularly welcome as a means of enabling ventures into new scientific areas. As other labs also started to evolve new and interesting ribozymes, the difficulty of evolving de novo proteins began to seem the greater challenge. We entered the field of protein and peptide evolution when Richard W. Roberts, a postdoc in my lab, learned how to trick the translation apparatus into covalently linking a newly translated protein to its own mRNA through the action of the antibiotic puromycin (11). Galvanized by this advance, I encouraged several new lab members to develop and use this mRNA-display technology to address fundamental questions about the origin of protein structure. Most significantly, Tony Keefe used this method to evolve a novel ATP-binding protein from a large library of random sequence polypeptides (12). Remarkably, this non-biological protein looks indistinguishable from any normal biologically derived small protein domain. Postdoctoral fellows John Chaput and Sheref Mansy continued to evolve this protein and study its structure over the following years. The development of this protein evolution technology led me to co-found a startup biotechnology company, together with Rich and my colleague Brian Seed. Although the company was not a business success, it was a very interesting and educational experience. The collaborative efforts of a team of scientists ranging from protein biophysicists to people with clinical drug development experience allowed us to evolve a small protein domain with therapeutic potential; this artificially evolved protein is now in clinical trials. While I have continued to maintain a focus on fundamental questions in my laboratory, I firmly believe that small startup companies are the best way to develop more applied research to the point that it can eventually be therapeutically useful. By the year 2000, I started to pay more attention to fundamental questions related to the origin of life. My interest in the role of compartmentalization and cellular structure in the origin of life was stimulated by discussions with Pier Luigi Luisi and David Bartel. A year of debate led to a synthesis of our views on the roles of genetics, compartmentalization and evolution, which we expressed in our 2001 Nature paper Synthesizing Life (13). This paper catalyzed my entry into the field of membrane biophysics, for I felt that having proposed a model for early cells in which bilayer membranes played a crucial role, it was incumbent on us to show that such models were physically plausible. I have to admit that I was somewhat surprised to find myself working with lipids and membranes, which are remarkably squishy and ill-defined by comparison with nucleic acids. However, in at least one way, the study of membranes composed of prebiotic building blocks such as fatty acids was perfect for me, since this field was filled with important yet technically addressable questions. When postdoctoral fellow Marty Hanczyc and graduate student Shelly Fujikawa joined the project, we were able to make rapid progress, and within a few years had demonstrated a proof-of-principle path for vesicle growth and division based solely on physical processes. I began to grow more confident that it might ultimately be possible to deduce plausible explanations for at least some of the mysterious steps in the origin of life. My enthusiasm grew when Irene Chen, a brilliant biophysics graduate student, made further progress by demonstrating a pathway for competition between protocells. We worried that our model protocells would not be able to take up nutrients, such as the nucleotides needed for the replication of their genetic material, but Sheref Mansy showed that this was not a problem. Most recently, another graduate student, Ting Zhu has come up with a very attractive pathway for spontaneous, coupled growth and division, so it is beginning to seem that the assembly and replication of protocell membranes is not as difficult as we once thought. Figure 4. Szostak lab group photo taken shortly after the Nobel Prize announcement. The dramatic progress in the identification of pathways for the self-replication of protocell membranes has encouraged us to focus on the hardest remaining problem, the replication of the genetic material. Here the big question is whether RNA was in fact the first genetic polymer, or whether RNA was preceded by some simpler, easier to make or more robust genetic material. This question has driven the most recent transformation of my lab (Figure 4), into a well equipped synthetic organic chemistry lab. We are synthesizing amino-nucleotides, the building blocks for phosphoramidate polymers, due to their greater reactivity than normal nucleotides. Alonso Ricardo, a postdoc, and Jason Schrum, a graduate student, have recently made very significant progress in the template-directed synthesis of 2′-5′ linked phophoramidate DNA (14), and we are now exploring a series of related polymers in a search for even better self-replicating genetic materials. The complexity and fragility of RNA long made it seem an unlikely candidate for the first genetic material, but this prospect has been revived by the brilliant recent work from John Sutherland’s lab in Manchester (15). With John’s former graduate student Matt Powner now in my lab as a postdoc, we are eagerly exploring new avenues to the chemical replication of RNA. It is thrilling to me to see people in my lab developing new approaches to the synthesis of modified nucleic acids, but the suspense is almost unbearable as we await the results of template-directed polymerization experiments. From our current vantage point, it is not clear whether there will be many solutions to the problem of chemically replicating genetic polymers, or just one, or none, but in any case it is an exciting quest. Encouraged by our small advances on the way, we are continuing to feel our way towards the tantalizing goal of building replicating, evolving chemical systems. 1. Szostak, J.W., Sparkuhl, J., Goldstein M.E., “Sexual induction in Eudorina: effects of light, nutrients and conditioned medium,” J Phycol. 1973; 9:215–218. 2. Szostak, J.W., Stiles, J.I., Bahl, C.P., Wu, R., “Specific binding of a synthetic oligonucleotide to yeast cytochrome c mRNA,” Nature 1977; 265:61–63. 3. Szostak, J.W., “Ray Wu, as remembered by a former student,”. Sci China C Life Sci.2009; 52:108–110. 4. Hinnen, A., Hicks, J.B., Fink, G.R., “Transformation of yeast,” Proc. Natl. Acad. Sci.USA 75, 1929–1933 (1978). 6. Orr-Weaver, T.L., Szostak, J.W., Rothstein, R.J., “Yeast transformation: a model system for the study of recombination,” Proc. Natl. Acad. Sci. USA 1981; 78:6354–6358. 7. Szostak, J.W., Orr-Weaver, T.L., Rothstein R.J., Stahl, F., “The double-strand-break repair model for recombination,” Cell 1983; 33:25–35. 8. Lundblad, V. and Szostak, J.W., “A mutant with a defect in telomere elongation leads to senescence in yeast,” Cell 57, 633–643 (1989). 9. Ellington, A.E. and Szostak J.W., “In vitro selection of RNA molecules that bindspecific ligands,” Nature 346, 818–822 (1990). 10. Bartel, D.P. and Szostak, J.W., “Isolation of new ribozymes from a large pool of randomsequences,” Science 261, 1411–1418 (1993). 11. Roberts, R.W. and Szostak, J.W., “RNA-peptide fusions for the in vitro selection ofpeptides and proteins,” Proc. Natl. Acad. Sci. USA 94, 12297–12302 (1997). 12. Keefe, A.D. and Szostak, J.W., “Functional proteins from a random sequence library,”Nature 410, 715–718 (2001). 13. Szostak, J.W., Bartel, D.P., Luisi, P.L., “Synthesizing life,” Nature, 2001; 409:387–390. 14. Schrum, J., Ricardo, A., Krishnamurthy, K., Blain, J.C. and Szostak, J.W., “Efficient and rapid template-directed nucleic acid copying using 2′-amino-2′, 3′-dideoxyribonucleoside-5′-phosphorimidazolide monomers,” J. Am. Chem. Soc. 31, 14560–14570 (2009). 15. Powner, M.W., Gerland, B., Sutherland, J.D. 2009, “Synthesis of activated pyrimidineribonucleotides in prebiotically plausible conditions,” Nature 459:239.